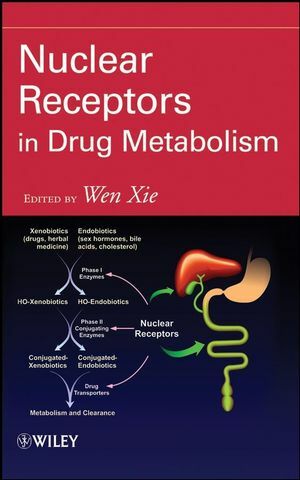 This book gives you an updated and expert overview of nuclear hormone receptors in drug metabolism and drug development and equips you with the interdisciplinary understanding of these receptors and how they can be regulated. Pharmaceutical researchers will find this extremely useful in developing drugs for cancer, heart disease, and diabetes treatment. This comprehensive resource collects scattered materials into one handy, informative volume. Wen Xie, MD, PHD, directs the Center for Pharmacogenetics at the University of Pittsburgh's School of Pharmacy. Among the courses he teaches are Pharmaceutical Analysis: Nucleic Acid Techniques; Pharmacogenomics: Pharmacogenetics of Drug Metabolizing Enzymes; and Drug Development. Dr. Xie is the author or coauthor of nearly seventy journal articles and more than seventy invited lectures. Chapter 1. Drug Metabolism: Significance and Challenges (Chandra Prakash and Alfin D.N. Vaz). 1.2. Phase I Drug Metabolizing Enzymes. 1.3. Phase II Conjugative Enzymes. 1.6. Challenges in Drug Metabolism. Chapter 2. Establishing Orphan Nuclear Receptors PXR and CAR as Xenobiotic Receptors (Tao Li, Junichiro Sonoda, and Ronald M. Evans). 2.2. Nuclear Receptor and Orphan Nuclear Receptor Superfamily. 2.3. Orphan Nuclear Receptors as Xenobiotic Receptors and Their Implications in Phase I Enzyme Regulation. Chapter 3. Nuclear Receptor-Mediated Regulation of Phase II Conjugating Enzymes (Olivier Barbier). 3.2. Phase II Drug Metabolizing Enzymes. 3.3. The Xenosensors CAR and PXR: 2 Masters Regulators of Phase II Metabolism. 3.4. AhR And Nrf2, Two Important Regulators of Phase II Enzymes. 3.5. PPARS and Phase II XMEs Regulation. 3.6. FXR/LXR and Phase II XMEs Regulation. 3.7. HNF and Phase II XMEs Regulation. 3.8. Regulation of Phase II Conjugating Enzymes by Steroid and Thyroid Receptors. 3.9. Concluding remarks and perspectives. Chapter 4. Nuclear Receptor-Mediated Regulation of Drug Transporters (Oliver Burk). 4.3. Induction of Drug Transporters by Activation of PXR and CAR. 4.4. Induction of Drug Transporters by Activation of PPARa. 4.5. Molecular Mechanism of PXR- and CAR-Dependent Drug Transporter Regulation. 4.6. Induction of Drug Transporter Expression and Drug Disposition. 4.7. Conclusions and Future Perspectives. Chapter 5. Structure and Function of PXR and CAR (X. Edward Zhou and H. Eric Xu). 5.2. Structure and Function of PXR. 5.3. Structure and Function of CAR. Chapter 6. Xenobiotic Receptor CoFactors and Coregulators (John Y. L. Chiang). 6.1. Regulation of PXR and CAR Nuclear Translocation. 6.2. Nuclear Receptor Coregulators and Epigenetic Regulation of Gene Transcription. 6.3. PXR and CAR Crosstalk with other Nuclear Receptors and Transcription Factors. 6.4. PXR and CAR Regulation of Lipid and Glucose Homeostasis. Chapter 7. Animal Models of Xenobiotic Nuclear Receptors and Their Utility in Drug Development (Haibiao Gong and Wen Xie). 7.2. PXR and CAR Loss-of-Function (Knock Out) Mouse Models. 7.3. PXR and CAR Gain-of-Function (Transgenic) Mouse Models. 7.5. Utility of Xenobiotic Mouse Models in Pharmaceutical Development. Chapter 8. Nuclear Receptors and Drug-Drug Interactions with Prescription Drugs and Herbal Medicines (Rommel G. Tirona and Richard B. Kim). 8.2. Prescription Drugs/Drug Classes Commonly Involved in Inductive Interactions. 8.3. Herbal Drug Medicines Commonly Involved in Inductive Interactions. 8.5. Clinical Aspects of Induction-Type Drug Interactions. 8.6. Inhibition of Nuclear Receptors in Clinical Drug Interactions. 8.7. Nuclear Receptor-Mediated Drug Side-Effects. Chapter 9. Genetic Variants of Xenobiotic Receptors and Their Implications in Drug Metabolism and Pharmacogenetics (Jatinder Lamba and Erin G. Schuetz). 9.1. PXR (Pregnane X Receptor) Background. 9.4. Genetic Variants in PXR’s Exons and their Functional Consequences. 9.5. Genetic Variants In Introns 2-8 and the 3’-UTR of PXR and their Functional Consequences. 9.6. Resequencing Strategy for the PXR Promoter and Intron 1. 9.7. Genetic Variation in the PXR Promoter and 5’-UTR and its Functional Relevance. 9.8. Genetic Variation in PXR’s Intron 1 and its Functional Relevance. 9.9. In Silico Analysis for Functional Effect of SNPs in PXR’s Promoter, 5’-UTR and Intron 1. 9.10. SNPs in PXR’s Promoter and Intron 1 Affect Putative HNF Binding Sites. 9.11. PXR SNPs Have Been Associated with Intestinal and Hepatic Inflammation and Diseases. 9.12. PXR Structural Variation and other Genomic Features. 9.16. CAR Alternatively Spliced RNAs. 9.17. CAR Genetic Variants (SNPs) and their Functional Consequences. Chapter 10. Beyond PXR and CAR, Regulation of Xenobiotic Metabolism by Other Nuclear Receptors (Martin Wagner, Gernot Zollner, and Michael Trauner). 10.3. Hepatocyte Nuclear Factor 4. 10.6. Peroxisome Proliferator Activated Receptors. 10.7. Aryl Hydrocarbon Receptor (AhR). Chapter 11. Emerging Role of Retinoid-Related Orphan Receptor (ROR) and Its Crosst alk With LXR(Liver X Receptor) in the Regulation Of Drug-Metabolizing Enzymes (Taira Wada and Wen Xie). 11.2. Orphan Nuclear Receptor RORα. 11.3. A Potential Role of RORs in Xeno- and Endobiotic Gene Regulation. 11.4. LXR and its Regulation of Drug Metabolizing Enzymes. 11.5. A Functional Cross-Talk Between RORa and LXR in the Regulation of Xeno- and Endobiotic Genes.